I'm counting down the days! Two weeks from today my Mom and stepdad, Bob will be here! We haven't had visitors from home in far too long and I'm aching to be with family. They visited last in 2012, I can't even believe it's been four years. One of the things that we did when they were here was attend Proms in the Park. We've been a few times and it's one of my very favorite British things to do. So a few weeks ago when we got an invitation from Branston to attend Battle Proms, we jumped at the chance. When we found out that it was at Highclere Castle, otherwise known as Downton Abbey, I was giddy with excitement. "Proms" is short for promenade concerts and is basically a series of outdoor concerts like a music festival. They date back about 100 years when concerts were expensive and attended by the wealthy few. This was a way to bring the music to the people. Common folk could stroll through the park and enjoy the orchestra and bands playing the popular music of the day. Battle Proms is a series of picnic concerts held each Summer at some of the UK's most fantastic stately homes. And we hit the jackpot! You'll probably recognize Highclere Castle as the the film location for Downton Abbey. I might have shed a tear as we approached. Highclere was the seat of the 5th Earl of Carnarvon. In 1922, the amateur Egyptologist was one of those responsible for the unearthing of the Tomb of King Tutankhamun. Matt made a beeline for the pickle van to try their other relishes, chutneys and table sauces. 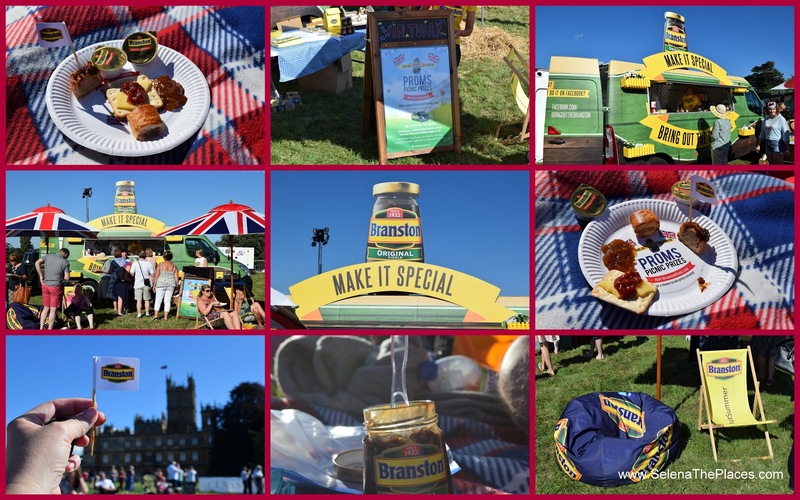 We even packed our own jar because it's not a true picnic without Branston. (Thanks so much for the invite.) We got there early so that we could get the perfect spot. We could not have asked for better weather. The day was gorgeous and warm. There were over 10,000 people there - "Hampers & Champers" all around. Tables and chairs, little tents for some shade. Bunting, flags and streamers, I even saw table clothes and proper china. Bunting and fairy lights, these people go all out. There are a few food and beverage vans on site, but it seemed most everyone brought their own feasts. I still can't get over the setting and had a few pinch me moments. We weren't able to go into the Jacobethan country house but we definitely plan to go back and take a tour. It's only about 90 minutes from us Hampshire, England. Battle Proms isn't just a picnic concert, it's a Summer celebration with music, history, Calvary, cannons and fireworks. There was a full program of events throughout the afternoon, leading up to the evening concert. On the sidelines was an encampment of Napoleonic re-enactors. I've decided that I want to join them. 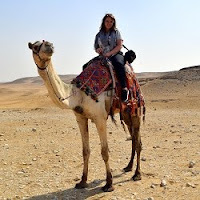 How fun to get dressed up in period costumes and stroll the grounds of Downton Abbey. And that's a line up of 200 Napoleonic cannons... more on that later. There was a Crown and Empire parade and a WWI Calvary display. The actors spent their time between events walking and talking with the crowd. It was a very interactive experience bringing history alive. This picture below cracks me up. Can you spot anything out of place? I loved the opening act. The Rockabellas are the modern day version of the Andrew sisters with "killer heels, killer curves and killer harmonies." Another highlight was the aerial display. A Grace Spitfire ML407 buzzed and looped overhead all choreographed to music. It got the crowd to their feet and the flags waving. As the sun set the musical program started. You haven’t experienced Beethoven’s Battle Symphony until you’ve heard it as was originally intended with the booming percussion of 193 actual cannons. Tchaikovsky's 1812 Overture played live was just brilliant in such an incredible setting. Battle Proms has teamed up with the charity Combat Stress. Since 2004, they've raised over a quarter of a million pounds for Veteran's mental health support. This incredible day came to a close with fireworks. There's just something about fireworks that turns me into a child again. I was actually laughing and squealing with happiness. By this time we'd made friends with those around us, linking arms to sing Auld Lang Syne. The perfect end to an incredible day that I won't soon forget. Unfortunately, last week was the final one for Battle Proms 2016. But next year is the 30th anniversary and promises to be bigger and better than ever. Follow them on Facebook or Twitter so you don't miss out. Be sure to include the Branstons when you pack your picnic basket. *We were guests of Branston for the day. All photos, writing and opinions are my own.